Soul Stories is an exploration of the boundaries of narrative within health and healing in the context of trauma and homelessness. 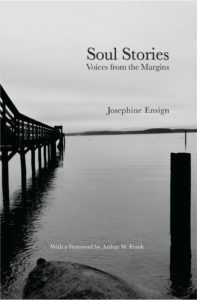 It draws upon scholarly research across a range of disciplines, and is informed by Ensign's thirty years’ experience as a nurse providing health care to people marginalized by poverty and homelessness, by her personal journey through homelessness as a young adult, and by her experience of teaching critical reflective practice to health science students. Soul Stories deepens our understanding of homelessness; trauma and resilience; gender-based violence; the role of narrative in health and healing; and ways we can humanize health care for patients, providers, and communities. It contributes to civically and community-engaged scholarship in the health humanities.